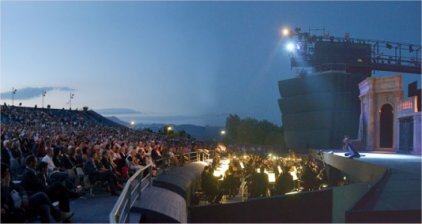 The Puccini Festival has been an annual event since since 1954, the place where the musical composer Giacomo Puccini spent most of his life in Torre del Lago. This small and pretty town is located between Lake Massaciuccoli and the Tyrrhenian Sea, in the municipality of Viareggio, on the Tuscan coast, approximately 18 km from Lucca and Pisa. Each year the Festival welcomes 40,000 people in its recently renewed open-air theater. It is an intense and unique experience. The theatre is surrounded by the lake and the moon. A short walk from the wood and the Villa Mausoleo, where Giacomo Puccini lived and worked. The lake and its surroundings were strongly loved by Puccini, who used to find peace here, sharing also his life whit the villagers and the community of resident avant-garde artist at the beginning of the last century. The closest cities to Torre del Lago are Viareggio (8km) or Pisa (18km). There are easy transportation by commuter train between Viareggio /Pisa and Torre del Lago. (train tickets sold locally for about 4Euro each) Trains are operating until 10pm, performances are ending around 11pm. Local taxi transfer after the performance possible (40 Euro per car). Private car transfers from Pisa airport (or Florence airport ) can be arranged to hotels. We also offer optional private guided Puccini tour of Lucca and also Torre Del LagoIn Lucca visit of Church of San Paolino e Donato, exhibit Puccini Opera, Piazza Napoleone, Palazzo Ducale, Tatro Giglio, San Martino Cathedral, Caffee di Simo than visit Villa Puccini at Torre del Lago, have lunch in Lucca or in Torre del Lago.Including private guide , entrance fee to Villa Puccini , lunch in Lucca or in Torre del Lago without drinks.